Is Your Google Book Incomplete? We May Be Able To Help. As many people know, Google has digitized hundreds of thousands of books from libraries around the world, including Columbia University Libraries, and they’ve created Google Books, a wonderful resource for readers and researchers. Subsequently Columbia and many other libraries have contributed their Google digital versions to HathiTrust to assure that the e-books are preserved into the future. 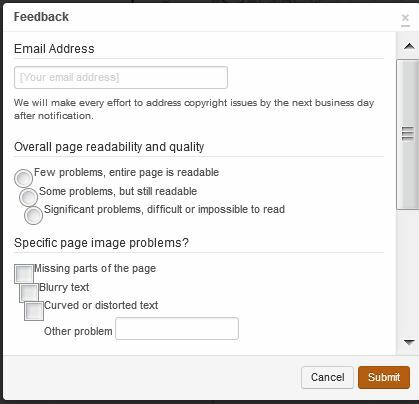 It’s also well known that some Google books have problems – for instance, because Google didn’t open out folded pages when the books were digitized, those pages are not visible to readers. 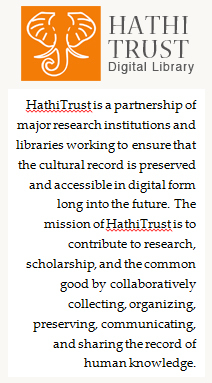 Recently HathiTrust and its member libraries have developed a process to fix some of those problems. 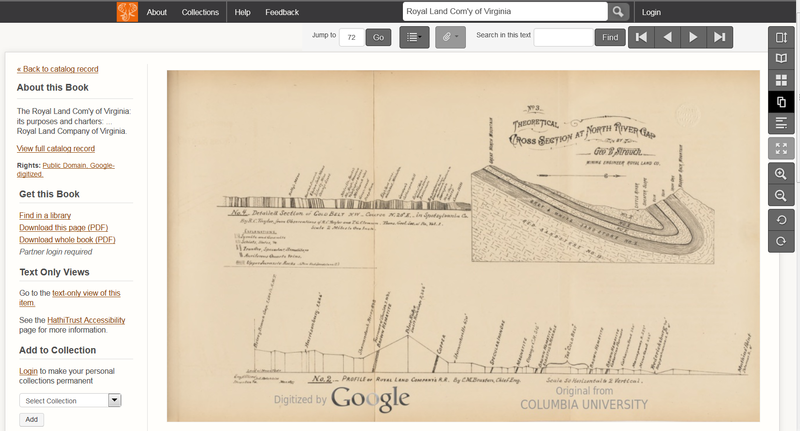 Let’s look at The Royal Land Com’y of Virginia, published in 1877 and digitized by Google in 2009 from a copy owned by Columbia University Libraries. Until a few weeks ago, anyone trying to read it on Google or HathiTrust, would have found unreadable folded plates, including this one that follows page 72. Someone reading the book on HathiTrust discovered the folded plates and reported them by using the Feedback button at the bottom of the page display. 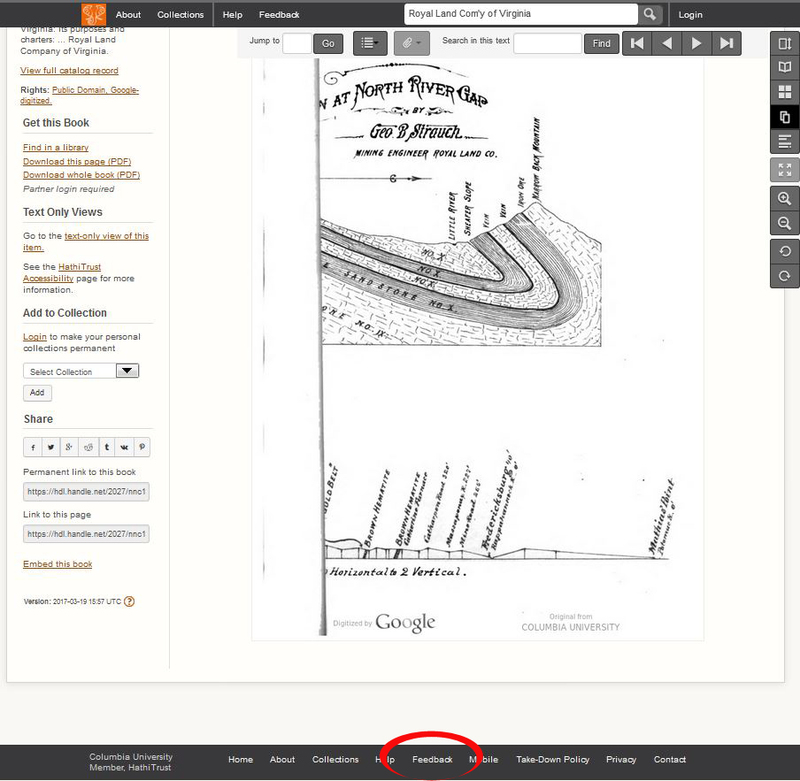 HathiTrust staff then notified Columbia, because it is our copy that Google digitized. We received messages of the form “the plate following page 72 of this title is folded and cannot be read”. That alerted us to the need for new digital images of the foldouts. When we looked at the volume, we discovered that the foldouts were torn. 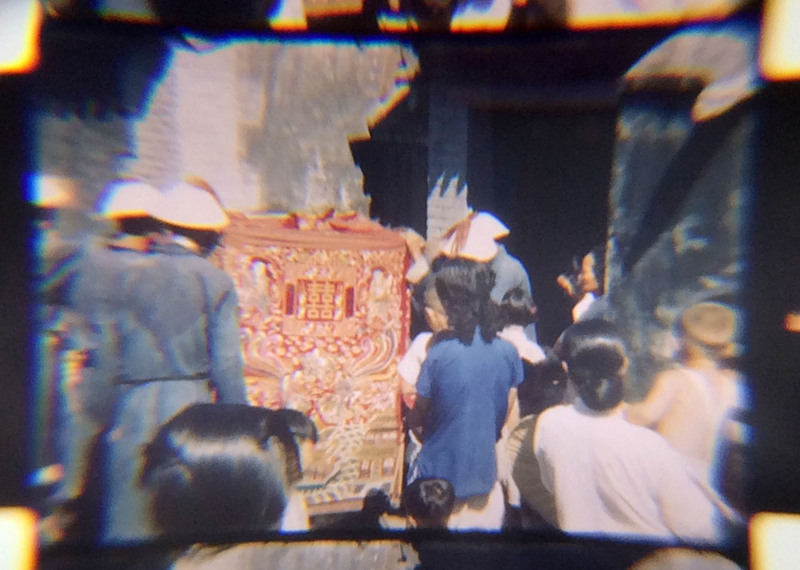 Conservation treated the damage, and then our Imaging Lab digitized the unfolded plates. We sent the images to Google, and they inserted the new images in place of the faulty ones. They then loaded the new version into HathiTrust to replace the incomplete copy there. Today the corrected e-book is available to everyone through Google and HathiTrust, and preserved for anyone to use in the future. Now that everyone has the ability to search and view millions of books online in a matter of seconds, libraries are taking time and effort to collaborate with HathiTrust and Google to solve problems. 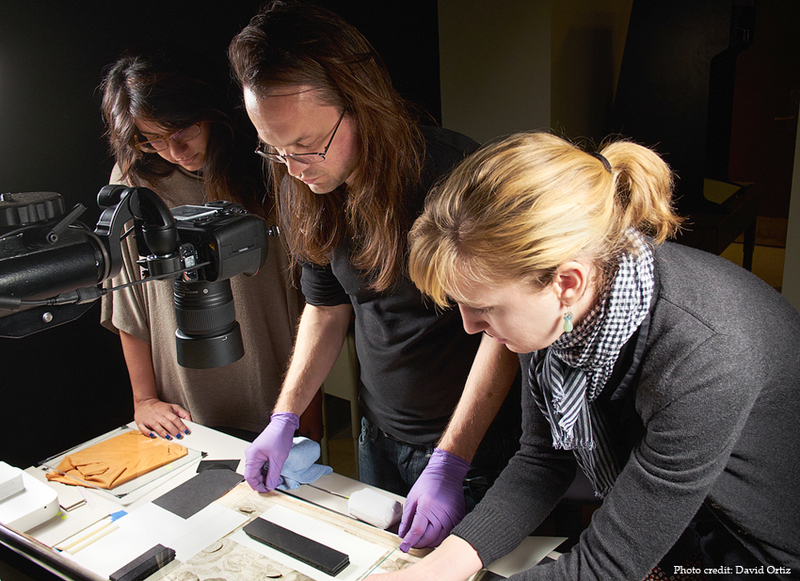 Behind the digital images that appear to be an easy click away, teams of library professionals are dedicated to digitizing physical books and improving the e-book experience. 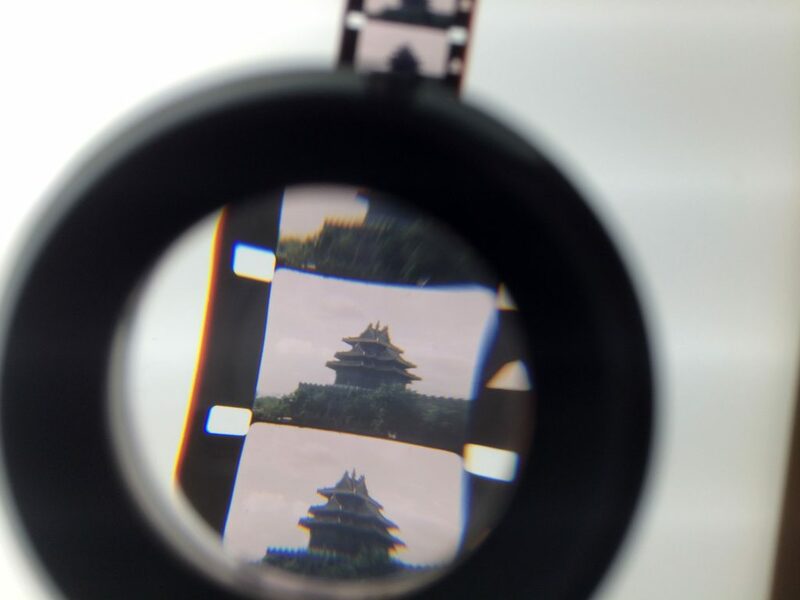 This entry was posted in Digitization, Preservation on April 28, 2017 by Janet Gertz.